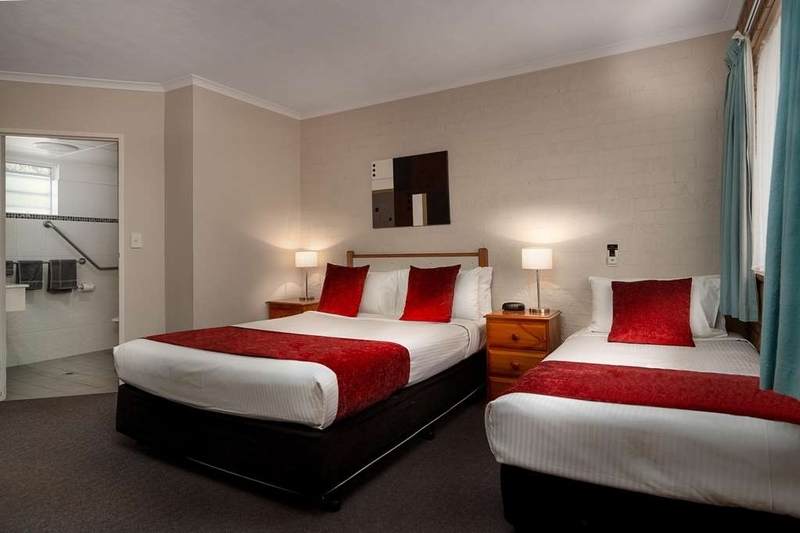 Il SureStay Hotel by Best Western Blue Diamond Motor Inn è situato nel centro di Dubbo. L'hotel è vicino alle principali attrazioni turistiche. Approfittate tutto l'anno del miglior prezzo garantito e di offerte esclusive. 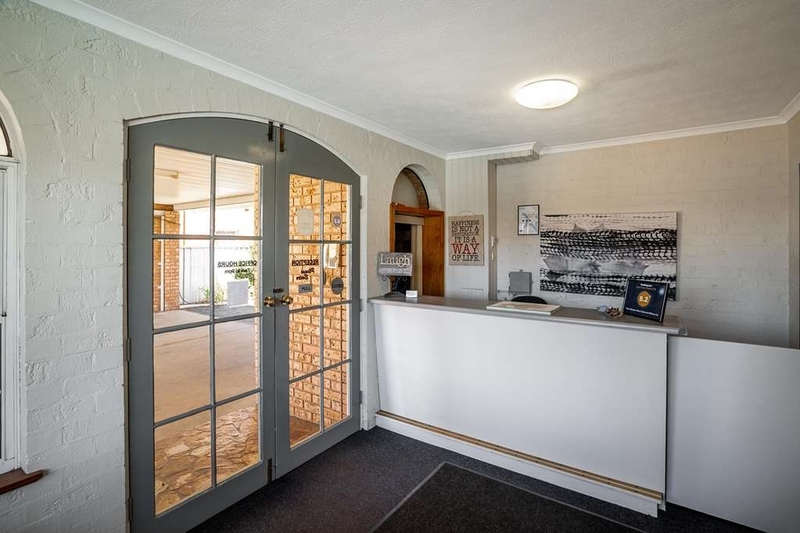 Vieni a soggiornare in questo motel di Dubbo, situato in posizione centrale e tranquilla, all'uscita dell'autostrada e nei pressi del vicino RSL and City Bowling Club, a soli cinque minuti a piedi da ottimi ristoranti e dalla principale via di negozi. Il SureStay Hotel by Best Western Blue Diamond Motor Inn è la sistemazione più pulita e comoda di Dubbo. La sua posizione nel cuore della città offre facile accesso alle attrazioni di Dubbo, come l'antica Old Gaol e il Western Plains Zoo. Il SureStay Hotel by Best Western Blue Diamond Motor Inn propone camere a 3,5 stelle arredate con gusto, con letti queen size, impianto autonomo di aria condizionata e TV via satellite con Austar. 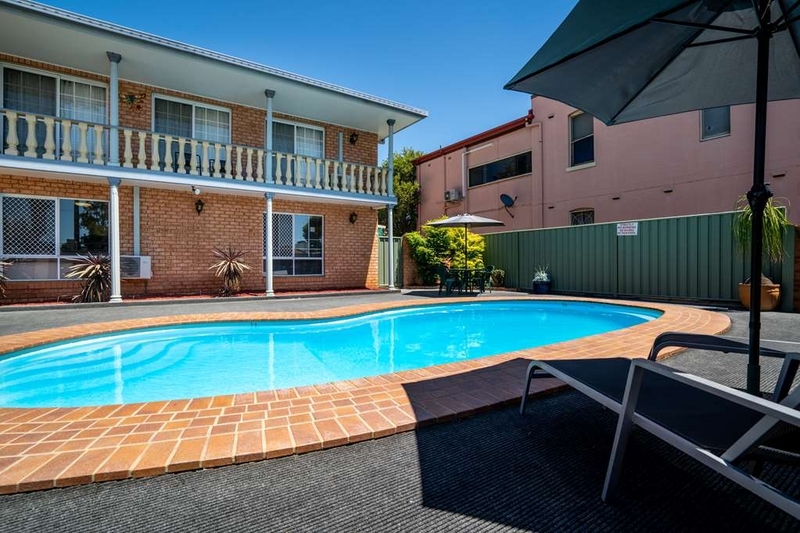 I comfort aggiuntivi di questo motel di Dubbo includono piscina all'aperto e un nuovissimo gazebo, perfetto per rilassarsi dopo una lunga giornata trascorsa a visitare le attrazioni locali. 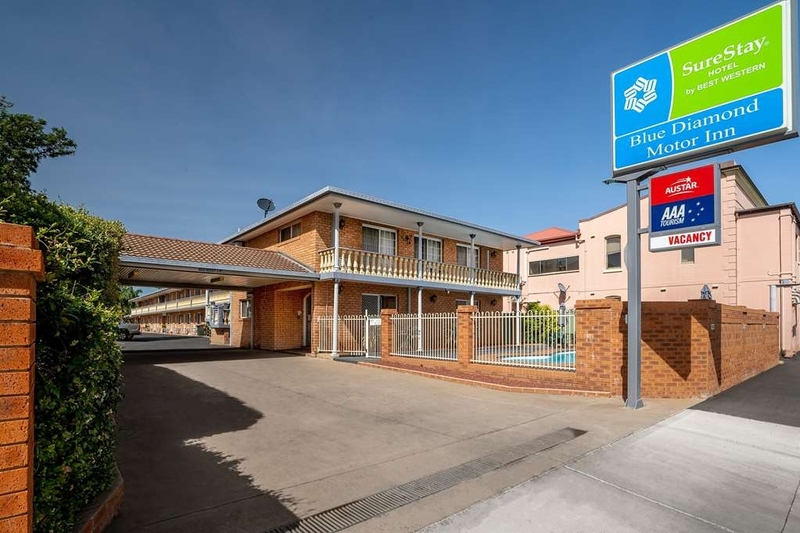 Per un servizio clienti di qualità superiore e una comoda posizione a Dubbo, prenota oggi stesso e risparmia al SureStay Hotel by Best Western Blue Diamond Motor Inn! Ti auguriamo un soggiorno gradevole! Lovely and clean. Great park up the road to walk the dogs. Service was excellent. So nice to be able to stay where you pets really are welcome. Got food delivered to room, many choices for that via Menulog. Very quiet location but close to city centre. An overnighter at the Blue Diamond Motor Inn whilst driving from Brisbane to Melbourne has been a pleasant surprise. The size of the rooms are very generous with all of the standard appointments - flatscreen TV, tea & coffee, and complimentary toiletries etc. The rooms are spotlessly clean, and whilst I've little to do with staff, the small interaction I have had, everyone seems pleasant. It is reasonably close to the centre of town so a short distance to cafe's and restaurants etc. It is also very good value for money given the size of the rooms. I will definitely stay here again if traveling through. We had a one night stay at this Motel, they only one room left when we booked, so was lucky to get in. The room was spacious with a comfy bed. A new kettle and toaster was also a nice touch. The lady at reception was very helpful with booking a room at another motel for the next night as the Blue Diamon was fully book for the Saturday night. 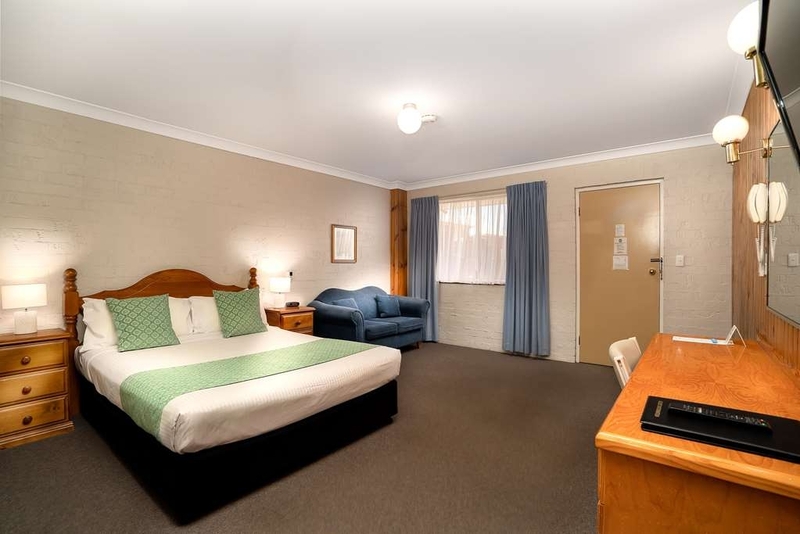 This motel is close to town and shopping centre. Dubbo City Bowls Club is almost across the road. We would be very happy to stay at this Motel again. 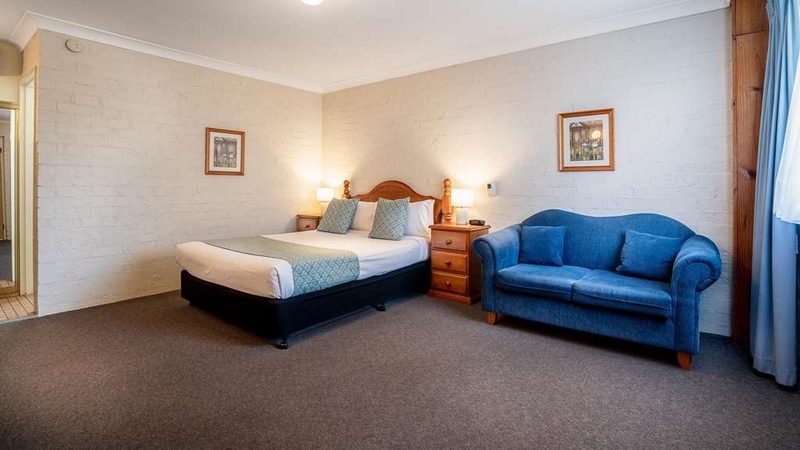 When staying in Dubbo we always book into the Blue Diamond Motel. 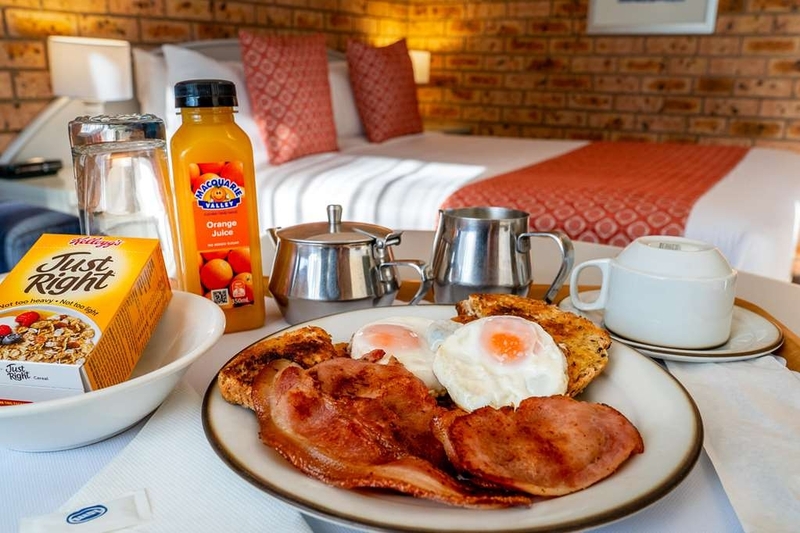 Lovely clean rooms and great breakfast. Showers are always hot. Always nice and quiet. No road noise. Highly recommend to anyone visiting Dubbo. 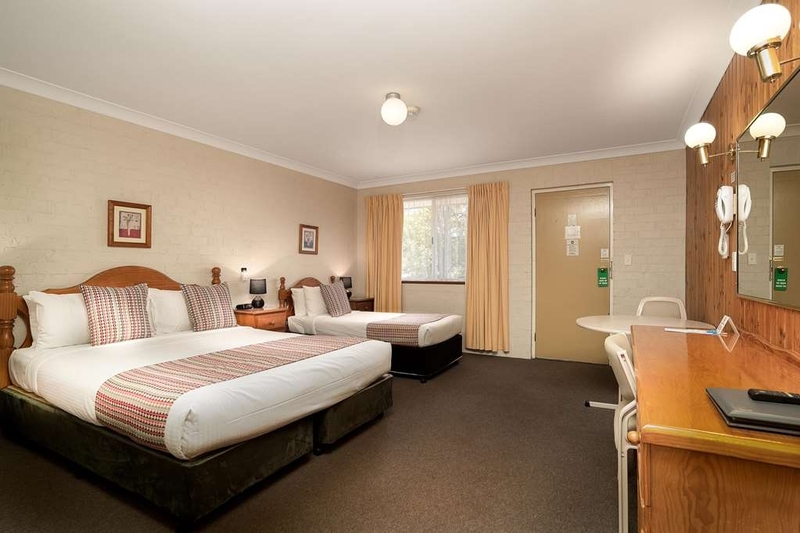 We hadn't stayed at Dubbo for many many years and found this Motel on Trip Advisor. The reviews I read were exact. Lovely refurbished rooms, reception staff very helpful and went above and beyond to help out with our needs. Lovely home cooked breakfast. Quiet location, very modern motel with a lovely ground floor room, and friendly managers, a pleasure to stay here after a long day in the car. We were given good advice about club dining at the local RSL, just down the street. "Clean, Comfortable and Quiet "
A great off highway option for a peaceful night sleep. Rooms are older style decor but spacious and comfortable. Really appreciated the use of blankets instead of overheating doonas. Find the nearby Castlereagh Hotel for a great Pub meal. Thank you for taking the time to review the Best Western Blue Diamond Motor Inn. We appreciate your feedback and we are pleased you enjoyed your stay. 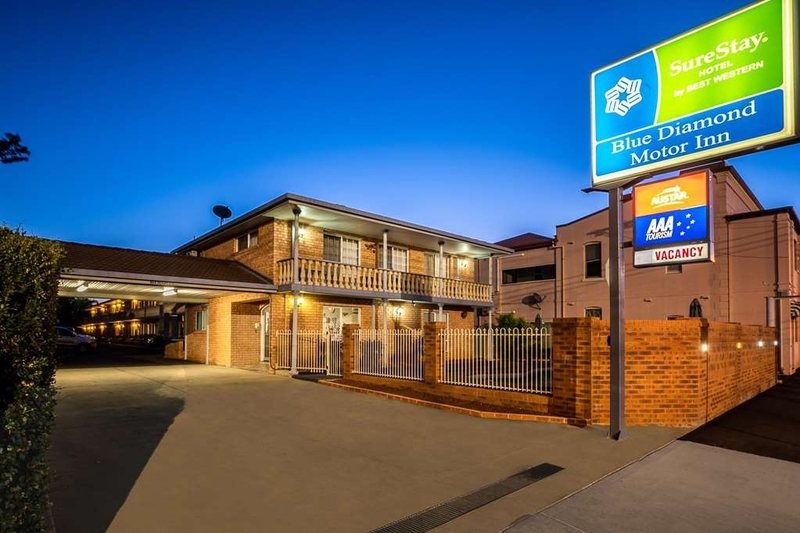 The Best Western Blue Diamond Motor Inn is under new management from the 29th June 2018. Checking in was easy and prices where on par, owner / manager was a nice fella. The place is very handy to the clubs., Walking distance. Rooms are a little out dated, but it still does the trick, bed was comfortable and shower was okay. We stayed at this motel twice in May. Whilst it is in the older category the price reflects this. It is all we needed for an overnight stay. It was comfortable, beds were good, everything worked. An added bonus was a toaster in the rooms. It is a short stroll to the RSL club which has great meals. "Nice room shame about the wifi"
Stopped here for one night, the room very nice, clean and after some tuition good air con with the weather being very warm. Only issue was the WiFi connection as you can only use on piece of equipment at a time. We were try to sort onward travel and this was very infuriating. "A sparkling diamond in the rough"
My good pal Auggie and I stayed here on a warm summer evening just after Christmas. Looking only for a bed to rest our legs and shower to wash our heads, we got all that and more. The two cobba's who run the joint are a crack up. I stuffed up my phone order and almost ended up with a double bed. Not fancying a night playing strange bedfellows with Aug, old mate suggested we make a pillow wall to avoid any uncomfort. Having a rye giggle, I said let's not play silly duffers and his mate sorted us a twin bed upstairs for the same price. Upon entry, we laid down our luggage and tag teamed the air con: sweet gentle bliss. We threw a few warm frothies in the fridge, and the William Shakesbeers were cold in no time. Situated a safe walk to the Rissole, we wandered down for a gander and decided our room was so good we'd rather eat there. Upon return, we flicked on the telly, watched the Big Bash, ordered a pizza and had a ripper sleep. In the morning, a tad dusty and a zoo trip ahead, the shower was perfect to get ol' Auggie in the driver's seat. Couldn't rate the place higher. Get around it. Stayed here one night before visiting the zoo. Accomodation is very clean. The air conditioning and fridge did had some trouble coping with the very hot day +40C weather. Wifi is provided from front desk but note token is to be requested from front desk and it's a single device specific so can't used across multiple devices. Rooms have sufficient tea/coffee making facilities and a nice dining table but only a single plate and no cutlery so keep that in mind when doing take aways. Also if visiting with elderly or small children ask for accomodation on the ground floor to avoid carrying luggage up and down the staircases. Found this Motel to be very quite. Free off street parking. Swimming pool was great after a long drive on a 39 degree day. The rooms had everything you needed, Good beds & pillows, very quite location. Breakfast ordered to our room arrived on time & was wonderful. We would highly recommend to any other traveller. We stopped here for one night to attend my husband's work Christmas party. Highly impressed with the cleanliness, very neat, updated bathroom, flat screen tv, excellent air conditioning and great information booklet. The only thing I could fault was the shower head but nobody likes a water saving shower head. Well done. I stayed here once... the receptionist couldn't work the eftpos machine and couldn't process my credit card, kept saying she was "just filling in"... I persisted and managed to find a payment method that worked... I was a bit annoyed, but too tired to bother posting here. I booked here again... I went to dinner at the local club... entered a raffle and won two hams! Feeling very happy I arrived at the motel at 9.05om ... the office as shut, no lights on. I rang the phone at the reception doorway.. explained I had 2 hams and was wondering if there was a fridge I could put them in till I left in the morning... was bluntly told: "you have a fridge in your room". I explained the small bar fridge wasn't big enough... was again told there was no fridge. I queried that such a large motel didn't have a large fridge, and was rudely role - "yes, I have a fridge, BUT IT HAS MY STUFF IN IT".... I responded saying I didn't appreciate the lack of assistance and wouldn't be staying here again. I'm amazed at the rudeness and lack of customer service skills this motel demonstrates. I won't be staying here again and will be telling all of my colleagues to avoid the place. "Quiet, Clean and Comfortable "
Stayed two nights here before and after the Mystery Box Rally. Nice large rooms with everything necessary for a good nights sleep. Good location too. Staff pointed me in right direction re local eateries. 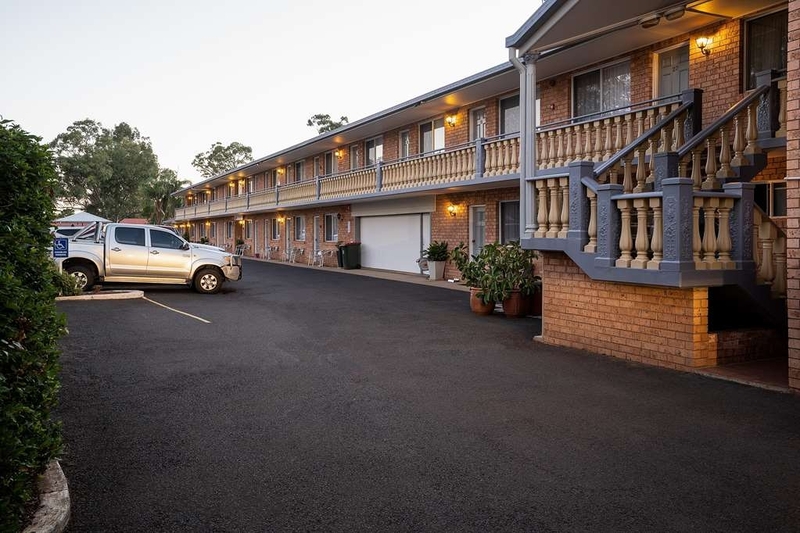 "Comfortable and quiet overnight stay"
A typical Australian ground and one level above motel block style complex with off street parking. Friendly reception, neat and tidy spacious rooms. Not on a busy street and well insulated with quiet A/C. Good location where can walk to several restaurants and not too far to reach retail therapy zone. Free and very good wifi. Overall very good value. "Clean, friendly staff all the amenities"
Love this accomodation and will be staying here again. Friendly staff, room really well appointed, especially if self catering some simple meals. Kids loved netflicks after a tv free week! Good selection in the mini bar, to compliment home delivered food. 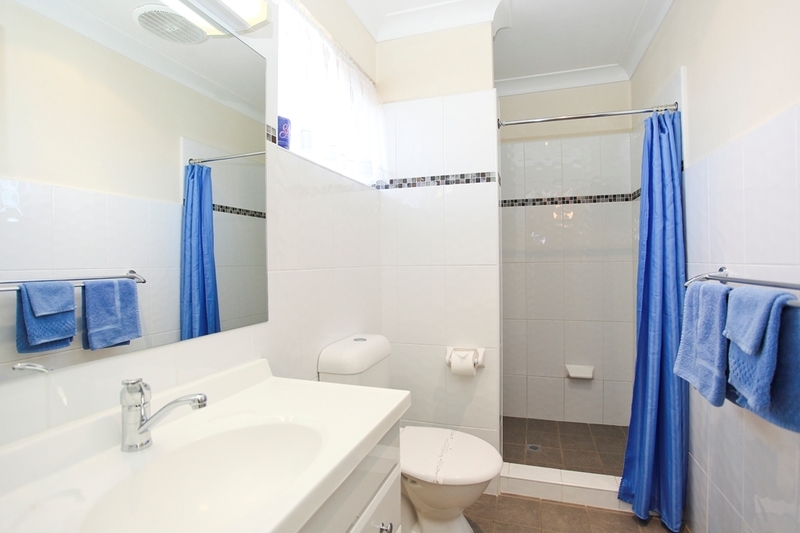 Perfect for a short stay, minutes to the main part of town by car, walk to the RSL. Very Clean, reasonable sized rooms. Walls are a tad thin, could hear the neighbors, but I think these ones may have been overly loud. Also, street neighbors like playing bongos! 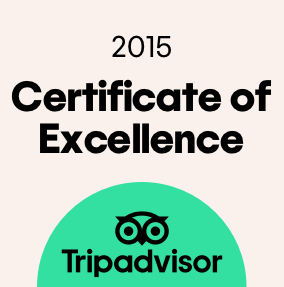 We have stayed here 3 or 4 times now and have been well satisfied on each occasion. The rooms are quite large with a queen bed, two seat sofa, table and chairs as well as wardrobe and luggage rack. The bathroom is not large but more than adequate for our needs. The room comes with the usual amenities including Jug, Refrigerator and tea, coffee etc. It is not a new property and is a little dated, and the touch lamps beside the bed always provide some amusement wondering when they are going to switch themselves on or off. Although it is on a busy road at front, none of the rooms face the road so a quiet night as well. It is only a short walk to the RSL for a meal and not much further to some interesting restaurants. "Clean, comfortable walk to club "
Stayed here after booking on qantas frequent flyer app. Room was clean and comfortable. But decor was dated. Walk to rsl and bowling club across the road. Main Street within walking distance. Room service for breakfast but no dinner available. "Was a place to sleep but wouldn't stay again"
Room was fine, however had some issues with booking. Dated room but everything seemed fairly clean and tidy. Over familiar person manning the front desk which was off putting. Next time I'm in Dubbo I'll be looking for somewhere else. I stayed here on business trip. The rooms were clean and tidy, 1980's decor. Touch lamp came on intermittently through the night. Ironing board needs a look at. Light in shower none existence. Staff were friendly enough. I preferred the best western blue gum. After a long drive we turned up in the driveway and thought to ourselves " he goes another stay in a dump" and the smell of cigarettes from an old lady on the balcony smoking didn't cement a good first impression BUT once in reception, things changed. The rooms are spotlessly clean, good size, comfy beds and working air conditioning. The bathrooms were really clean. The facade is a bit dated but the rooms are very pleasant and will stay again. Three of us stayed at the Blue Diamond for two nights in two rooms and thoroughly enjoyed our stay. The rooms were large, spotlessly clean and well furnished with a comfortable queen bed, sofa ,table and chairs and bench space. The bathroom was modern and there was plenty of water pressure. Breakfast was excellent, served on time and hot. There is a very nice, secluded swimming pool which is very welcome on a very hot day. 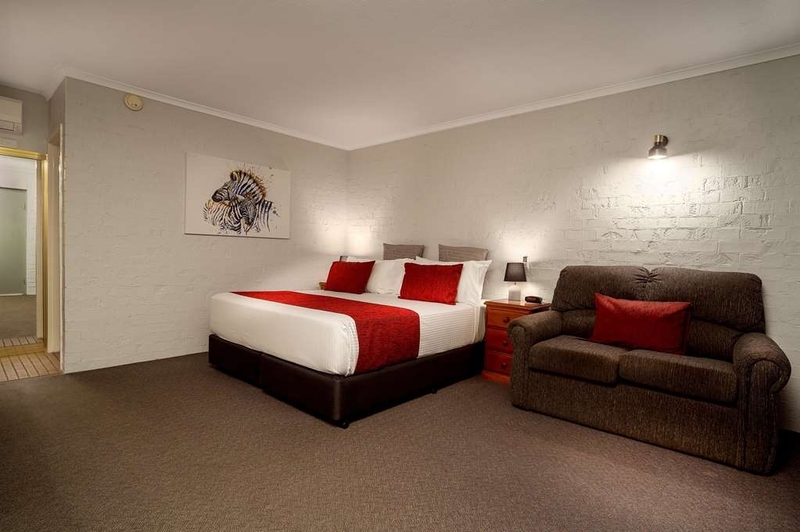 The motel is conveniently located close to clubs,pubs and CBD. It is off the main highways and is very quiet at night. We were most impressed with the professional, polite and friendly greeting we received from both Michael and Jack. Nothing was a problem to them. The room was clean, nice and spacious. The bathroom was clean. Wifi is available and I had no problems using it. The owner Michael is professional , polite and welcoming. The standard he maintains in the Motor Inn are high and what you would expect of a 4 and a half star hotel. "A great place to stay, nice, quiet and great service"
Hot outside, but the air conditioner and pool made all that much difference. Close to town. Staff that actually talk to you. Room service - breakfast - on a public holiday, one of the best room service breakfasts I have had in a motel. It was hot when it arrived. Very nice. Stayed here twice, five years apart, and while the management has changed, it's still friendly and good value for money. 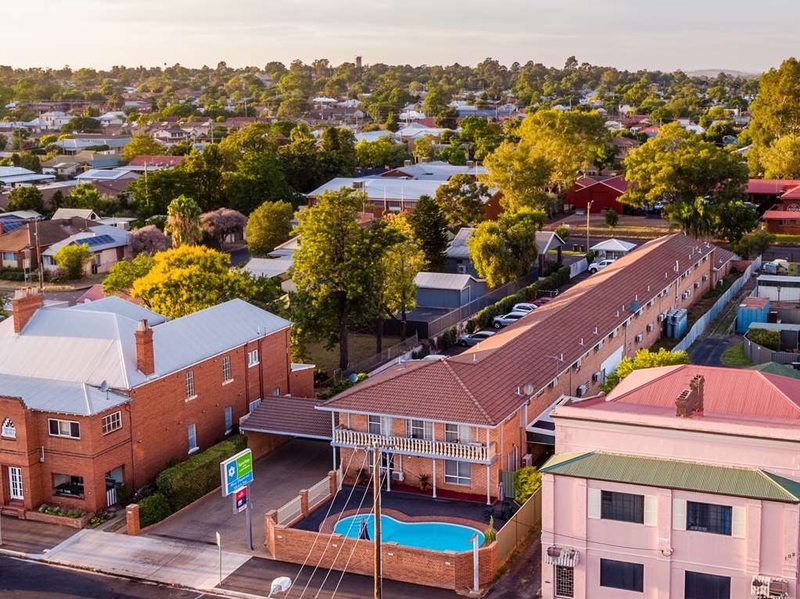 Room clean and spacious, bed comfortable, and easy walking distance to the Western Plains Cultural Centre in one direction and town centre in the other. Our room towards the front of the motel was quiet. Recommended. 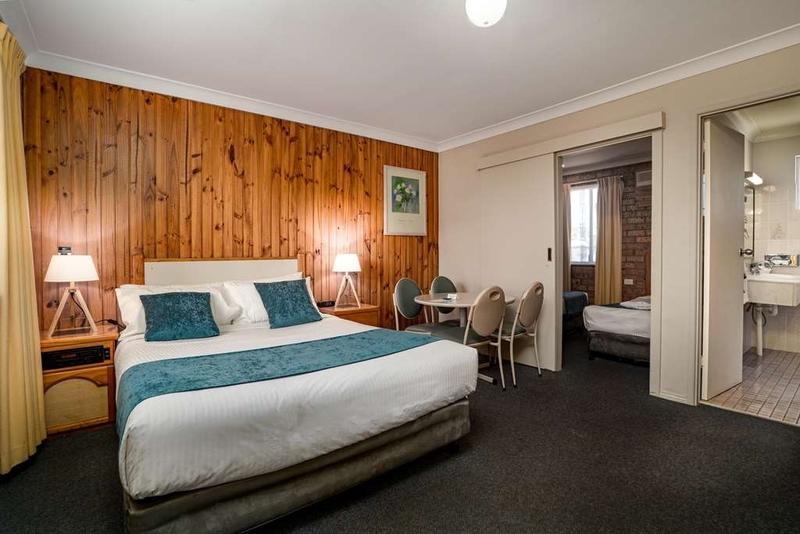 I travel a lot, things that are important to me are a good iron, ironing board, TV and shower that all work - Blue Diamond has all of this and while the rooms are a bit dated they a wonderfully clean and comfortable. The location is excellent and I found the reception service excellent. Car parking is definitely first in best dressed but I think most motels are these days given the cost of centrally located land. No problem coming back, and I am sure I will. Stayed here on a business trip. Reception on arrival was horrible. Felt like I was an inconvenience. Downside: Shower ran hot and cold with lousy pressure. I was frustrated with the poor temperature control. Upside: Room was very clean. Motel is located off the main road in a quiet part of town. Not likely to return. Hi Roslyn K, Thankyou for taking the time to make comments regarding your stay. Firstly you were not an inconvenience. You seemed out of sorts when you arrived and more so when you were made aware that the American Express Card you used to book your accommodation with incurs a 3% surcharge and we gladly accepted a different card, not sure how you could be unhappy with that. We assisted you where we could on arrival. That was our first and last interaction with you during your stay. Our rooms are extremely clean and we appreciate you saying so. Maybe next time you have a problem with something let us know during your stay so we can assist you. Complaining on TripAdvisor doesn't help anyone or resolve the issue you had. 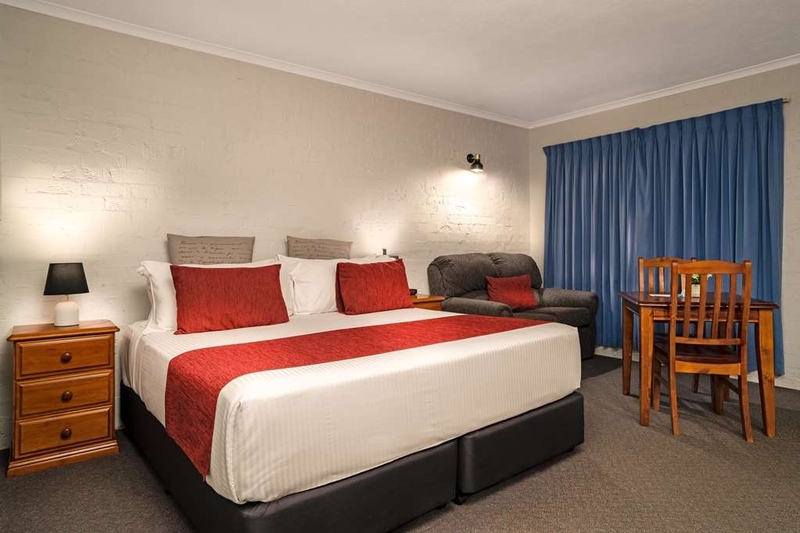 The Blue Diamond is a well placed Motel, reasonably priced for Dubbo with well fitted out furnishings. Then why have I given it only three stars? Management attitude. We had three complaints, the hot water is spasmodic resulting in a good physical work out as you boil or freeze, the free internet, which is quite fast, does not work with Samsung galaxy without querying the desk about how to connect, where the remark about just how good "Apple" is was rather annoying. The third issue was where to eat. The desk person put down the local RSL which is two streets down with comments about food poisoning and stories of hundreds of complaints from his patrons. His recommendation was about 5kms away and was packed to the rafters on a Monday night, hordes of children and a noise level just below a busy train station. It was a bistro meal so we went back to the RSL, much quieter, again a very busy bistro meal and similar in interior, well priced meals, but it is what it is - a big country bistro. I joined the RSL ($5) and saved substantially on meal purchases, we ate there for all three nights. As a mid priced motel this is fine. Clean and comfortable but pretty dated rooms. Good central location with no street noise. I would probably stay again but for a few extra bucks there are some much better options in Dubbo. 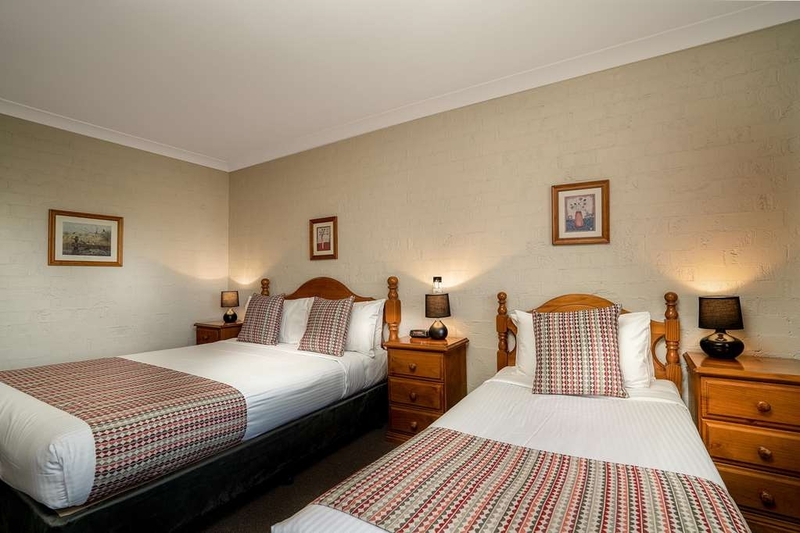 This hotel is close to the main street of Dubbo. It is very quiet. The owners are friendly and nothing is too much trouble for them. The rooms are large, light and spacious. There is a decent bathroom but not much cupboard space if you want to hang things up. The car parking is tight if you have a big car and if the hotel is full then it's first in, best dressed or you park in the street. The street is well lit. I didn't have any problems leaving my car in the street. The wifi is free but the password needs to be reset every 12 hours which can be annoying. It is also quite slow. I don't normally review accommodation, as long as it's warm clean and dry I just move on, however this one was so bad I thought I would make the exception. The room was cold, the heating not great and the place was dated and not very clean. The bed had a electric blanket on but the plug could not go in the socket behind the bed because the headboard was fitted over the power socket. There was something not right with the electricity as the lights kept flashing on and off even when it was in the off position. I was part of a group 7 people staying there and we discussed if we should talk to management/owner about it but thought the better of it as they weren't very approachable and quite frankly treated guests like an inconvenience. The vibe is definitely confrontational, as I'm sure will become evident in their reply to my post. So far their approach to every complaint is "YOU'RE wrong and other people say we are great" Awful place will not stay again. "Good value for money but nothing special"
Not a bad place to stay the night. Nice and clean and price is right. The beds are a bit hard and the rooms are nothing special but it does the job. The shower is nice and the place is clean and it is quite conveniently located. The Blue Diamond has large, clean rooms and friendly, helpful staff - everything was good EXCEPT the shower was easily the worst that I've ever experienced. I was in Dubbo for a week with work and started each day pissed off about the shower. Misty inadequate volume that could not be adjusted to a comfortable temperature for more than 3 seconds. I won't be back. Hi Evan, Thankyou for taking the time to make comments about your stay at our Motel. I find your comments quite upsetting given that you have complained about the shower on multiple social media networks and made an untrue statement about "nobody has complained before". None of my staff said that. You made a statement to me on the last morning of your 4 night stay whilst I was delivering your breakfast. I suggest the next time something isn't to your liking that you say something during your stay rather than on the last day. Had you have said something to the "helpful staff" your words. The problem would've have been resolved. It's your choice not to return to our property, however in the future I suggest to complain at the time as to at least give the Motel staff to fix any problems that arise becuase complaining on social media fixes nothing. The Blue Diamond is centrally located across from Dubbo's Victoria Park sporting complex. This makes it lovely and quiet which is a plus in a city where many of the motels are adjacent to the highway. Rooms are roomy, clean and well appointed, good shower and comfortable bed. Unlike other reviewers I found the service warm and welcoming with helpful suggestions re eateries. Close to CBD. Best Western Blue Diamond Motor Inn This is an owner operated motel. The reception staff are very obliging, informative of the local area and friendly. The room was very clean, comfortable, quite. 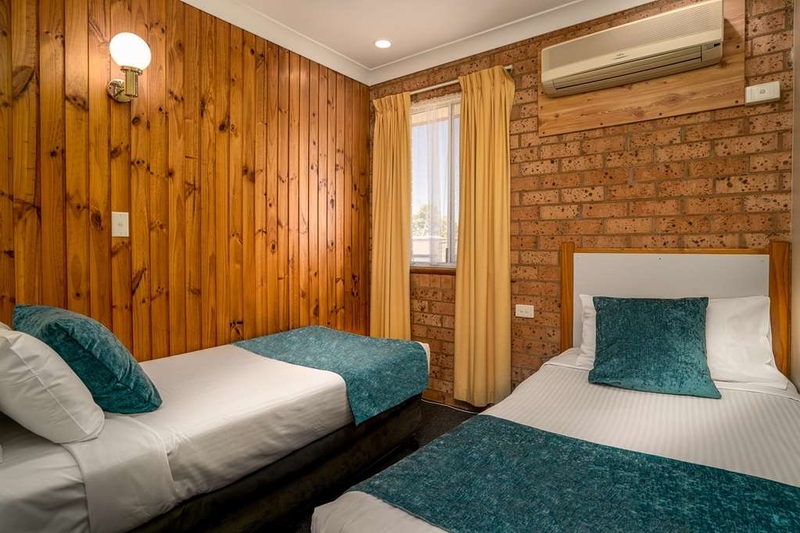 The motel is in a good location, 5 minute drive to the Western Plains Zoo, walking distance to the Bowling Club and RSL Club. 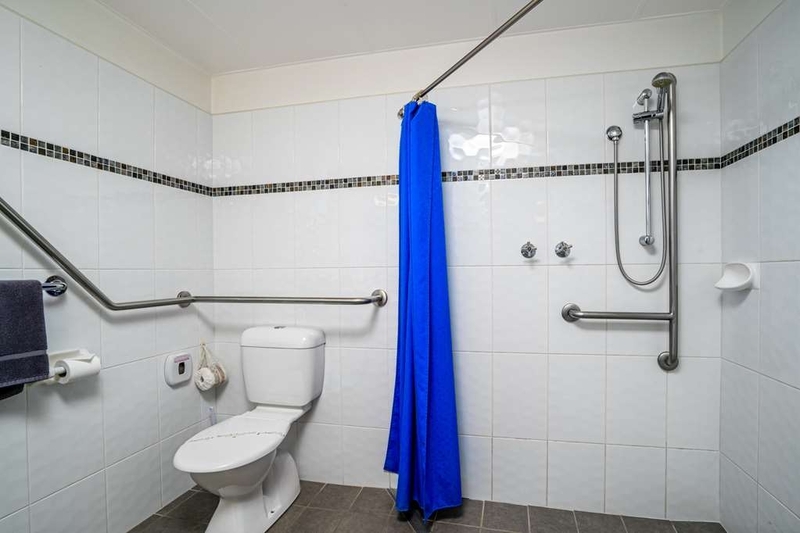 This motel offers parking and room facilities for those who are physically disadvantaged. Would we return again, yes, certainly. I was in two minds as to whether to make this review as we never got as far as booking into the place, but I think our experience is worth noting. We had booked a room for two nights (4-5 March) to watch a couple of our grand-kids at the State Little Athletics in Dubbo. There were a couple of options with regard to the amount you had to pay. Being retirees we chose the cheaper option which meant that if you cancelled you didn't get a refund. Fair enough. Woke up at around 1am on the 4th with my back in spasm. Had to wait till around 930am to see a Chiropractor. The up-shot was that I was in no condition to drive anywhere. Got home from the Chiro around 1230pm. Rang the Motor Inn around 1pm to say that due to a medical problem we would have to cancel our accommodation. The person at the Motor Inn was less-than friendly. I believe his words were, "Ya shoulda told us before 4pm yesterday. We can't use that room any more" (Huh???). I said that at 4pm yesterday we were still planning on coming, but this conditions popped up the next day. I believe his next words were something to the effect of "Yeah well thanks for telling us, but you can't get your money back" I didn't even ask for it back, and as for not being able to use the room, well that's a load of crap. In fact they could end up having the room paid for twice - once by us and once by another traveller passing through. I think the main thing that got me was this persons total lack of empathy. I didn't expect sympathy. It would have been nice to at least have him say sorry that you can't come, or maybe hope you feel better soon, or even hope we may see you again some time. Just something other than "well you won't get ya money back". Hi Stephen, We really appreciate you taking time to make a comment. Unfortunately your booking was a "Non refundable" type of booking. Whilst all was done to be empathetic to your requirements there wasn't alot that could be done due to the way in which you made your booking. Perhaps in future book directly with our property or make a fully flexible booking so that a refund may have been possible. It's a little unfair that you chose exaggerate your experience on Trip Advisor when we did all we could to assist you, given the way in which you made the booking. I had a comfortable stay here for business. My luggage was misplaced and I was going to be late for check in. I called to let the manager know that I was on my way and would be arriving after check in closed. He was very accommodating and asked if I needed any assistance. 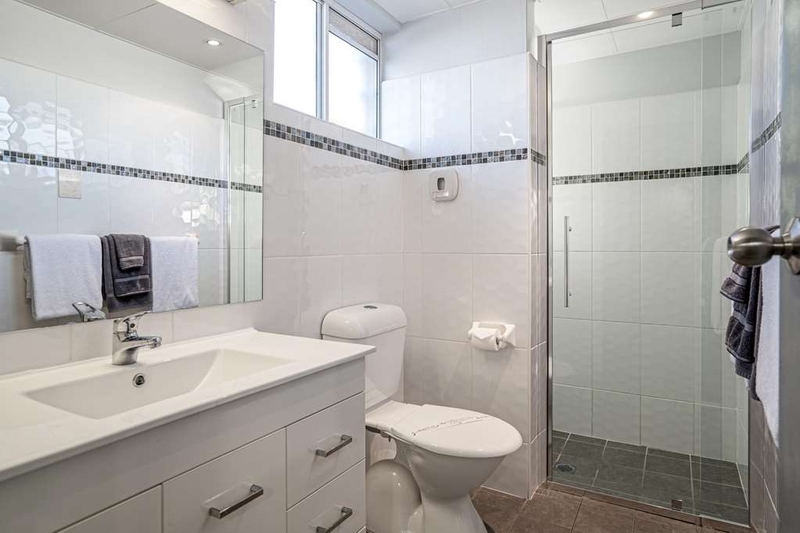 Large sized rooms and bathroom. I couldn't work out how to turn on the AC but small potatoes really - if it wasn't so late I would have called to ask. "Nice room, poor attitude "
The room was clean and comfortable, however, when I checked in, much later than normal, 11:45pm, I called reception and asked for the Internet Wi-Fi username and password. I was promptly told the office was closed. I remarked that the hotel folio said to "contact the front office "anytime" to retrieve the password for the Wi-Fi." The sleepy man on the end of the phone said "I'm sorry the office is closed." Fair enough, it was late, however, the wording needs to be changed on the folio. I felt like I didn't get my moneys worth and the manager could care less whether I was happy or not. Dear Puppetmaster2015 aka David Strassman, Thankyou for taking the time to comment on the cleanliness and comfort of our rooms it is appreciated. I will pass those comments onto house service. Your tour manager called and asked to check in early and did so at 1:30pm. She collected all the keys for the group including your key David. As far as we knew that was the time you checked in, not 11:45pm as you stated in your remarks. She was asked at the time of check-in was there anything else that she required and there was not. Returning to your room after your performance at 11:45pm is not checking in. Had you checked in at 11:45pm you would have been offered Wi-Fi at that time. Your call was to the after hours manager, who was asleep as it was after midnight. Your remarks about the Wi-Fi are actually incorrect, as you didn't read the "folio" correctly. No where in the folio does it read ""contact the front office "anytime" to retrieve the password for the Wi-Fi." Had you taken the time to read all the content relating to the Wi-Fi access and connection instructions, it actually says "Wi-fi username and password may be obtained on request from reception anytime during reception hours". You say fair enough it was late, the manager did care about your happiness David, however your tone was rude and arrogant and given that it was after midnight and the office closed at 9pm. Nothing he said you wanted listen to. As the owner of the Motel I felt it necessary to respond to your comments personally. Stayed here 1 night. Good bloke on reception recommended appropriate spots for dinner. Room was clean and fresh. Air con easy to work. Bed comfy. Multiple TV channels. Although not used, the pool was sparkling clear. Easy walk into main drag for whatever you might need. Recommended. Stayed 1 night as a half way stop between Brisbane and Melbourne. Off the highway, no traffic noise, opposite a park. Large. clean and airy room. Within walking distance to the Dubbo RSL club for dinner. This was our 2nd visit here and will return. The Blue Diamond was ok for a bush motel. UHT milk which was disappointing after a long day on the road. Air conditioning struggled and the fridge didn't freeze the ice blocks. Drive to nearest restaurants. We ate at Gina's pizzas which was good. "Comfortable, clean and close to town"
I was in town looking for somewhere to stay during the busy school holiday break when we found this place. The receptionist was very friendly and helpful. Our room was clean, tidy even a nice new bathroom. Seemed quiet and close to town. Good for a couple for a few nights. Pleasant stay. Reasonably priced. Everything was neat and tidy, and very clean. Room was quiet, I couldn't hear the people next door. The only issue was the parking. The place was packed out and parking was of a premium. 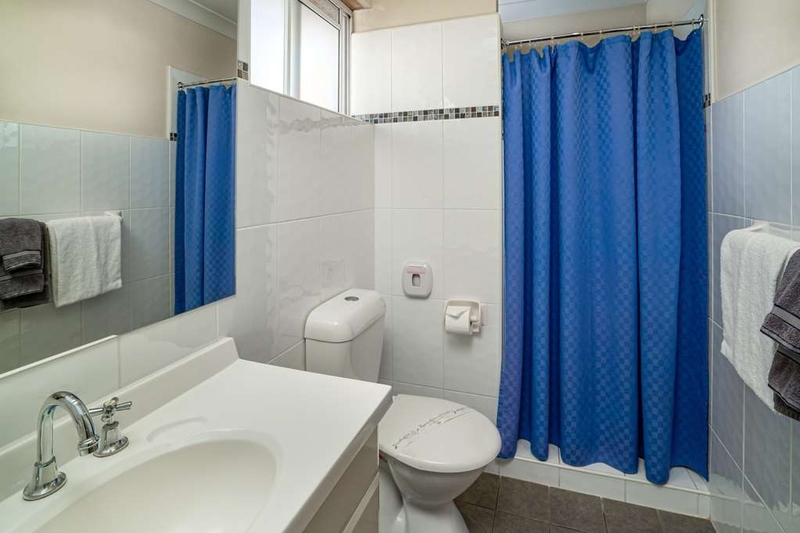 This motel is 1960s build appearance, but the room has been kept updated with a very modern bathroom. Rooms are large, would normally pay a lot more for a room this size. Everything spotlessly clan and breakfast was really good. Generally a good overall comfortable country motel. The room was clean, tidy and comfortable. The beds are firm, and plenty of extra pillows and blankets available. The breakfast was hearty, hot and tasty. There are no dinner amenities available, so it's take away or a short walk to pubs or the RSL. 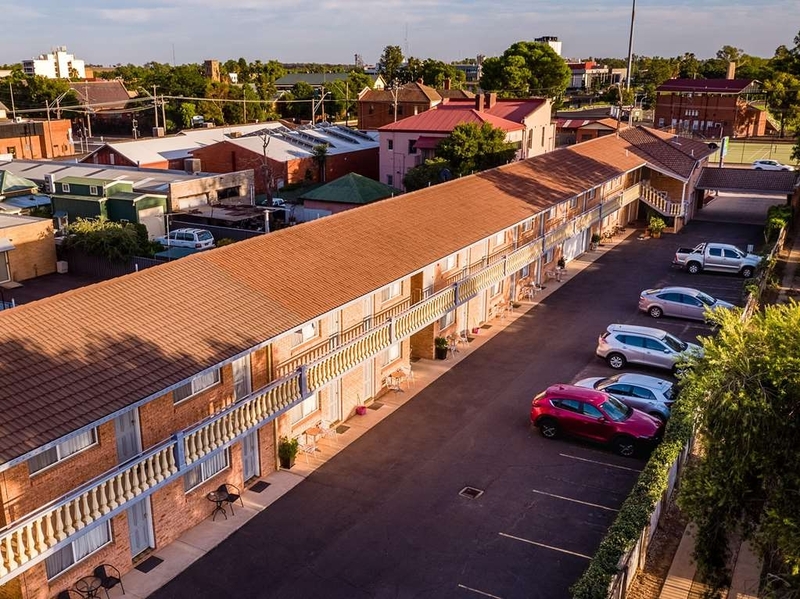 "Quiet motel in centre of Dubbo, immaculately clean with a good in room breakfast"
I stay at this motel once or twice a year on business. New owners have just taken over the management. I find it a great place to stay. It is now even better. The rooms are very clean and tidy, with new bathrooms. For my in room breakfast I ordered fruit and cereal. Most motels provide tinned fruit for breakfast. The Blue Diamond provided a fresh pink lady apple and good sized banana. I was really impressed. I cut up the apple, enjoyed it for breakfast, and saved the banana to eat whilst waiting for a plane later in the day following my meetings.